Gift plants provide a long-lasting gift that the recipient will cherish for years to come. The right gift plants thrive in common household or office environments and need little special care. Such plants offer a fuss-free, living gift that last much longer than cut flowers and delights the recipient. Whenever you choose a plant, it’s important to know where it will reside in the home or office to ensure it receives adequate light. It’s safe to assume that most offices rely upon artificial lighting for illumination so it’s best to choose low-light plants as gifts. Even homeowners may not have adequate lighting for plants that crave bright, direct sunshine if other buildings or tall trees shade the windows. Most florists are aware of this problem and can guide you to plants that thrive in low-light areas. Spathiphyllum (Peace Lily) – Spathiphyllum offer long, dark green sword-shaped leaves and beautiful white flowers. Flowers are very long-lasting, although they do not offer any discernible scent. 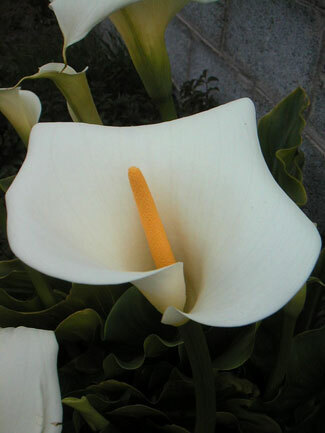 Peace lilies thrive in offices under artificial lights or in low-light areas in the home. They do need adequate water and will wilt whenever the soil gets dry. Most florists include a card or pamphlet with instructions on how to care for gift plants. Orchids – You may be surprised to learn that orchids can grow in low to moderate light and that they do just fine in an office environment. While people tend to think that orchids are fussy plants, they’re relatively care-free. Phalaenopsis orchids, also called “Moth Orchids,” offer white, pink, purple and orange-colored flowers on long-lasting stems. The flowers last 8 to 12 weeks. Pothos – These plants have heart-shaped leaves in various colors, including dark green, green and gold. These trailing plants offer luxurious foliage and do fine in low-light areas. In fact, they tend to sulk if they get too much light. Although they don’t have flowers, they’re so easy to care for that even the worst “black thumb” recipient can keep them alive. If you know for sure that the recipient has more light available, any of the following flowering plants offer beautiful, fragrant gifts. Roses – Miniature roses are a favorite gift plant. Instead of giving a cut-flower bouquet, a miniature rose bush blooming with tiny, perfect roses lasts far longer and miniature roses can be planted in the garden just like a larger rose bush or kept as house plants. Myriad colors are available including white, yellow, lavender, pink and red. Flowering jasmine – This has one of the strongest, most fragrant blooming flowers among all the houseplants. The small white to yellow star-shaped blossoms bloom during the winter when many other flowering plants remain dormant. Although they need plenty of sunlight, jasmine brightens anyone’s day. Daffodils and other forced bulbs – During the springtime, many florists offer daffodil, jonquil and hyacinth plants in bloom as well as cut flowers. These are often grown in special glass vases or jars with water and pebbles; they can be planted in the garden when they’re finished blooming. Another beautiful aspect of sending flowering plants as gifts is the wonderful cachepots or gift pots included with the plant. These include vases such as the forcing jars or vases used for daffodil and hyacinth bulbs, baskets, ceramic containers and even tiny decorative metal watering cans. You can find themed pots for new babies, birthdays, graduations and more. Often, a certain pot or container is included in the price of the plant. If you want a different container, ask your florist. Your florist may offer it at no charge or charge a little extra to change out a themed container. Ordering plants as gifts is a thoughtful way to give the gift of flowers that lasts a long time. To order flowering plants, visit your favorite local florist or order from online florists, nurseries and garden centers.